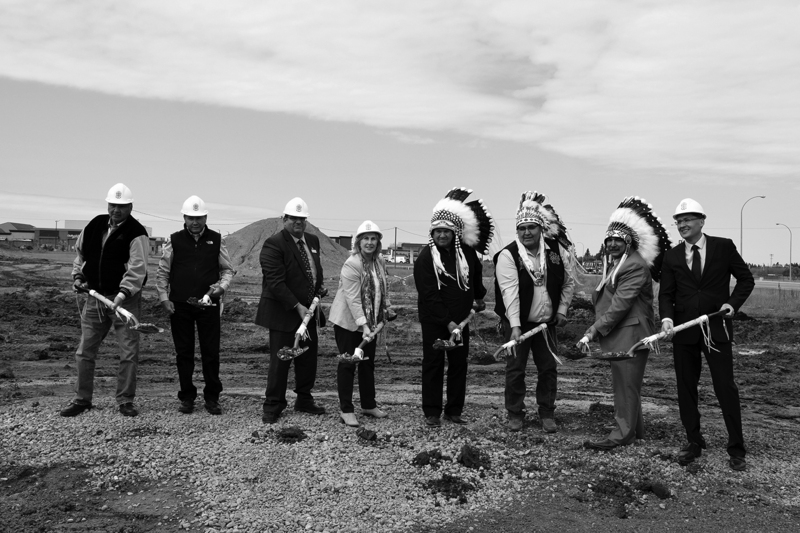 The Border Tribal Council and the Saskatchewan Indian Gaming Authority (SIGA) held a sod turning ceremony today to mark the official groundbreaking for the Lloydminster casino development – this will be SIGA’s seventh entertainment destination in Saskatchewan. Chiefs Wallace Fox and Wayne Semaganis, from Onion Lake Cree Nation and Little Pine First Nation, respectively, on behalf of the Border Tribal Council revealed plans for the Eagle Park West development and reaffirmed their eagerness to expedite construction of the new casino. Chief Reginald Bellerose, Board Chair for the Saskatchewan Indian Gaming Authority, speaks to the key partnerships involved. The land for the development is owned by Little Pine First Nation, which is responsible for site development. The casino property will be leased to SIGA by the Border Tribal Council, the facility landlord, which will be responsible, alongside SIGA, for the facility development. SIGA will operate the casino and follow the same profit distribution model as its other six casinos as outlined in the Gaming Framework Agreement, with profits being administered by the Province of Saskatchewan. 25% is shared with the provincial government’s General Revenue Fund. “The new casino will have significant benefits for Lloydminster – it will create local employment, provide funding for city services, non-profit and charitable organizations, and it will support local businesses through service agreements and by attracting tourism dollars to the community,” says Zane Hansen, President and CEO, Saskatchewan Indian Gaming Authority. Participating in the sod turning ceremony were First Nation Elders, representatives from the FSIN, Border Tribal Council, Onion Lake Cree Nation, Little Pine First Nation, the Saskatchewan Indian Gaming Authority, and from various levels of government. SIGA continues to strengthen the lives of First Nation people through employment, economic growth and community relations. SIGA operates six other casinos in Saskatchewan in North Battleford, Prince Albert, Saskatoon, Swift Current, Yorkton and on the White Bear First Nation near Carlyle. SIGA’s casinos offer a distinctive First Nations entertainment experience that reflects the traditional aspects of First Nations heritage and hospitality.